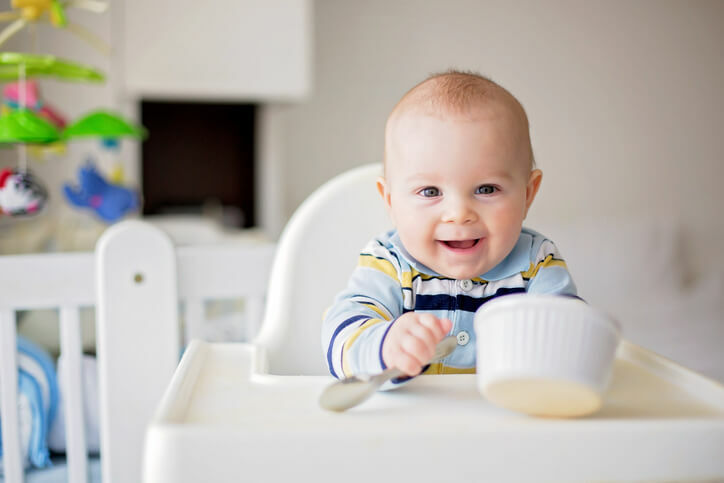 Is your little one ready for more grown-up mealtimes? Here's everything you need to start the messy eating adventures — just add carrots. This sturdy yet sleek high chair gets everything right: an easy-to-remove tray, quick-clean cushions, space-saving design, and fun colors. The 5-point harness and crotch post keeps new eaters secure, and as they grow the seat adjusts, the post comes off and they can join you at the table like a big kid. Bonus: The chair and cushion are pvc-, phthalate-, and bpa-free. Since the need to feed can strike anywhere, this portable seat makes a great diaper bag accessory. Available in several fun prints, the fabric harness fits most chairs so you can eat out without worrying about germs on those gunky, wobbly restaurant high chairs or balancing a squirmy baby in your lap. Machine-washable, of course. These bibs are a triple threat: waterproof, absorbent, and reversible. The only thing they can't do is clean the sweet potatoes baby smashes in her hair. Until that technology gets sorted out, pick up a pack of these all-purpose bibs, which feature Velcro closures and a waterproof inner layer sandwiched between soft terry material. Messes will happen, but these bibs will help contain them. Full disclosure: You do not need a special baby food maker -- a blender or food processor will do just fine -- but this little handy little appliance can make life easier. It steams, blends, warms, or defrosts up to 2½ cups of baby food at a time, and it comes with an 85-recipe booklet to get you started. One big plus: It shuts off automatically when the steaming is done, so if when you get interrupted, your batch of parsnip-apple stew won't be ruined. When freezing homemade baby food, many moms use simple ice cube trays, but if you want to ditch the plastic altogether and invest in containers that will last beyond your baby's mushy food stage, try these colorful glass cubes. Safe for the freezer and microwave (without the lid), they lock securely with a silicone seal and come in several sizes, starting at 4 ounces. There are lots of baby food books out there full of delicious puree recipes. That's great, but in Parents Need to Eat Too, Debbie Koenig lets us in on a secret: Babies don't need separate meals. Alongside each new-parent-friendly meal in this book, Koenig tells how to make them into baby food. Less work, and the whole family is happy, not hungry. You may be looking at these and wondering, Where's the valve, where are all the tiny pieces? Exactly. If you want to teach your baby to drink from a cup, those spill-proof valve systems work more like bottles than cups -- and you'll lose your mind trying to clean them. These colorful, bpa-free cups aren't completely leak-proof, but the lids fit super-tight. Our only improvement would be handles for easier grasping.